Endocrine Disruptors – According to the EWG1, there are 12 hormone altering chemicals we should do our best to avoid. Dubbed the ‘Dirty Dozen’, these chemicals are dangerous and in prevalent use in the US today. The EWG describes Endocrine Disruptors this way; “There is no end to the tricks that endocrine disruptors can play on our bodies: increasing production of certain hormones; decreasing production of others; imitating hormones; turning one hormone into another; interfering with hormone signaling; telling cells to die prematurely; competing with essential nutrients; binding to essential hormones; accumulating in organs that produce hormones.” Among the dozen listed is Phthalates, labeled simply as ‘fragrance’ or ‘parfum’. And they are in wide use in personal care products. A news article in the US News Health2 section reports new research linking phthalates to type 2 diabetes and childhood obesity. The best policy is to choose cosmetics and personal care products that are free from the unnecessary use of synthetic fragrances. Anyone Down for Some Freebies? Getting them is so easy. 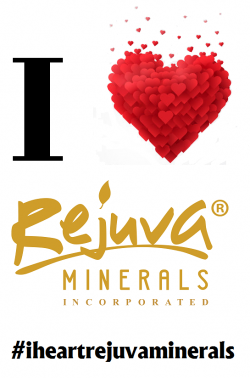 Just post a pic on Instagram of your fave Rejuva Minerals product(s), tell us what you love about your pick and add the hashtag #iheartrejuvaminerals! Be sure to post it publicly or tag us so that we can SEE your entry! You can use the link at the bottom of this page to enter. An 18 gram Multi Task Powder, 1 Pur’ Lips Lipstick in Red, Red Wine, 1 Sheer Pomegranate Lip gloss, 1 Soft Rose blush, a Flat Top Buki Brush and a Soft Blush Brush! Best of luck!! Author Rejuva MineralsPosted on February 4, 2016 Categories Contests, UncategorizedLeave a comment on Anyone Down for Some Freebies?